"The wicked will tell us anything to haunt our thoughts long after, Nehemia had warned her." So Empire of Storms was just recently released in all its glory (the cover is on fiyaaah). 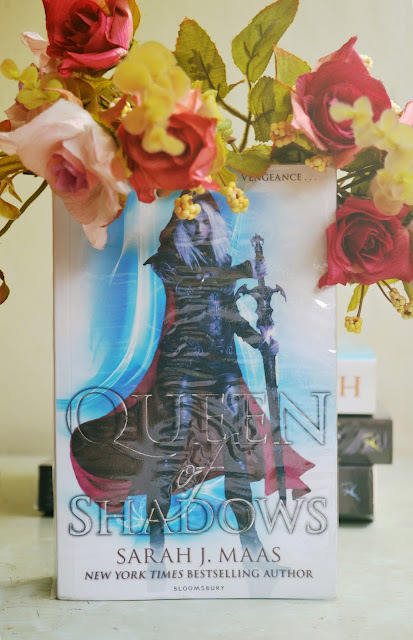 I haven't read that yet, and don't worry I am going to read that soon (when school work permits lol) so for the mean time, here's what I thought about the fourth book in Sarah J. Maas's Throne of Glass series, Queen of Shadows. The whole book, I kept thinking "wow, kickass aelin!" also "no, rude, arrogant aelin!" I don't know how rude and arrogant became so similar to kickass but hey, I took it and survived just so I can see Dorian and Aedion's fate. Yup, those are the two things I wanted so desparately from this book because of how these two boys' fates were royally cliffhanged by the end of Heir of Fire. Eitherway, I finally got to meet Arobynn and wow, he is so cunning and creepy. He sort of met my expectations of him for the things Aelin has. I haven't read about him in Assaassin's Blade by the way, reason why he's so new to me. Reason why everything the books are trying to reference to the events that took place in this book were all new information to me that I couldn't quite pick up on properly. I didn't even know how far off Lysandra and Aelin's riff have been. Lysandra is another of the badass women of YA. I love how she's actually a shape shifter and that she's badass and sweet at the same time. The progress of their relationship from mortal enemies to girl best friends was refreshing for me especially since I don't think I've read a lot of YA women being best friends and being into girl stuff-- makeup, dresses, jewelry. Just goes to show you can still have your dress shimmery, lips red, and eyebrows done while slaying Valg princes. "But he wished she had killed him. He hated her for not killing him." I have to repeat it even if I already mentioned it in my Heir of Fire review: I love Aedion and Aelin's relationship. Even if in the some parts of the books, Aedion felt like he was creepily obsessed with his cousin, I am going to stand by my feelings of admiring the love these two have for each other. This book has a lot of Aelin and Aedion bonding moments in store. We also get to know more about Aedion: aka his dad being one of Rowan's bros in Maeve's warriors, Gavriel, hence, making him actual half-Fae. Speaking of Rowan: I definitely don't fancy the romance between him and Aelin. It feels weird. I was looking forward to seeing them like best best friends but here we are. We're getting some romance here-- an steamy romance. I'm not too eager for this, seeing how Aelin already has three different guys in the past and none of those three worked. By this time, I think this series could still work even without romance between Aelin and any of the other characters. Manon's arc was a roller coaster ride in this book too. To me, she turned out as the better attempt at Aelin's character. She's a total badass-kickass without sending off arrogant and insane, murderous vibes. Even if she isn't supposed to be the human here, she felt the most human in character personality to me. Trying to make rational decisions and feeling sympathy for her people and the people around her and not running around like the stereotypical witch character usually played out in other literary works. Elide Lochan definitely added to my interest for Manon's arc too. If anything, I'm also excited for the next part of both Elide and Manon's arcs. We still have no idea if Manon is going to actually play friend or foe to Aelin's new kingdom. I'm also feeling something, as if it's foreshadowed, that she's going to end game become more entangled with Dorian. Queen of Shadows ended in a very City of Glass (The Mortal Instruments) way. Everything felt right but you sort of just know that something is bound to happen next. You sort of just want to leave things at that but something is still lingering and it's not quite over. We read that it's not just the King of Adarlan who is taking control. There's also the battle with the witches. There's the challenge of a new kingdom both for Dorian and Aelin. Empire of Storms, surely, is going to be the start of a new battle.